We all know the old adage 'life it what we make it' but this is hard to swallow if you are one of those who always seems to get the worst of everything while others seem to float through life as if on a cloud of glory. Is this really the way it is or is it the way we perceive it? The old half empty or half full glass comes into play here. A pessimist will sit and constantly bemoan their ill fortune while the half full brigade will see every obstacle as something to be overcome. This is particularly prevalent in the workplace where opportunities come and go like no other environment, These outstanding business ecards send out the message that “What seems to us as bitter trials are often blessings in disguise”. 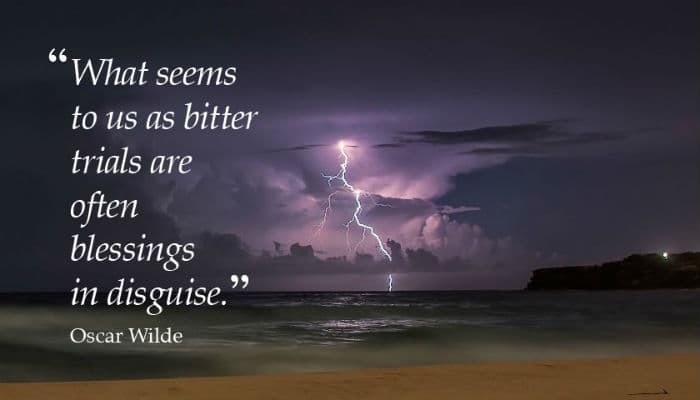 Words from Oscar Wilde set across a background of a striking electrical storm. A setback should be viewed as an opportunity to get it right next time, and this is the perfect way to send a message of encouragement to a work colleague currently wallowing with a half empty glass. Add a personal message and send it their email address and watch the reaction when they know somebody believes in them and is encouraging them to take the positive from their setback. We would love to hear from you this Christmas holiday season to discuss how our holiday ecards for business can deliver a wow to your seasonal marketing activity.